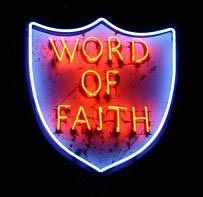 Banner Ministries: What do the Word-of-Faith or Prosperity Movement Leaders Teach? Here's a compilation of quotes from the tapes, videos, book and TV appearances of various popular leaders (some from the list compiled in 1992 by Jim Fox and previously on this website in a separate document). This is just a SMALL selection of quotes! Many more could be gleaned from books, tapes and articles. Benny Hinn: “Those who put us down are a bunch of morons. ... You know, I’ve looked for one verse in the Bible, I just can’t seem to find it. One verse that says, ‘If you don’t like ’em, kill ’em.’ I really wish I could find it. ... Sometimes I wish God would give me a Holy Ghost machine gun — I blow your head off!” (Benny Hinn on TBN’s “Praise-A-Thon,” April 1990). Beny Hinn: “Be careful! Your little ones may suffer because of your stupidity. Now I’m pointing my finger today, with the mighty power of God on me, and I speak. ... And your children will suffer. If you care for your kids, stop attacking Benny Hinn” (World Charismatic Conference, Aug. 7, 1992). Kenneth Copeland: “Several people that I know had criticized and called that faith bunch out of Tulsa a cult. And some of ’em are dead right today in an early grave because of it, and there’s more than one of them got cancer” (“Why All Are Not Healed,” tape #01-4001). Benny Hinn : "We are living in the most exciting days in history. Now are you saints ready for what the Lord is going to do in the coming few months and years on earth. The church of Jesus is coming into a new demension in the spirit. I am not just saying it these are not empty words. God Almighty is about to bring his church into a new dimension. Now please here me we have heard it prophesied through Kathryn Kuhlman, Smith Wigglesworth, Oral Roberts and others that have come before. We are living in the day when the greatest of all outpourings is going to begin. If you should peek into tomorrow, if God should allow you to see whats coming you would not be able to sleep for probably a year; you would not know what to do with yourself. Blowing people down with the "spirit"
The anointing or power plays a major role at Benny Hinn's "miracle services." Hinn blows or throws the "anointing" and "slays" people from a distance. As Mike Thomas reported in Florida Magazine, Nov. 24, 1991: "Winded catchers try to keep up with the toppling bodies. He rears back and with a pitching motion slays the entire choir with one toss. "That's power," yells Benny." "POWER!" ... Hinn takes off his custom tailored jacket and rubs it briskly on his body. He is rubbing the Power into the jacket. Then he starts swinging it wildly, like the biblical David swinging his sling. He decks his followers left and right. Bam! Bam! Bam! The stage vibrates with their landings. Then he throws it [the "anointed" jacket]. Another bam. As a catcher moves to pick up a woman, Hinn slays him ... then he slays the catcher who caught the catcher. When Benny Hinn is moved, nobody is safe from the Power ... [H]e blows loudly into the microphone ... Hundreds fall backward ... a woman collapses in the aisle and begins to babble. And then, suddenly, Benny is gone. The power vanishes from the room, and the people stare in stunned silence." Fred Price: "If you keep talking death, that is what you are going to have. If you keep talking sickness and disease, that is what you are going to have, because you are going to create the reality of them with your own mouth. That is a divine law." (Fred Price, Realm, 29). Kenneth Copeland : "The force of faith is released by words. Faith-filled words put the law of the Spirit of life into operation. (The Force of Faith, Kenneth Copeland, Ft. Worth: Kenneth Copeland Publications, 1983). Kenneth Copeland : "What you are saying is exactly what you are getting now. If you are living in poverty and lack and want, change what you are saying.... The powerful force of the spiritual world that creates the circumstances around us is controlled by the words of the mouth." (The Laws of Prosperity, Kenneth Copeland, Ft. Worth: Kenneth Copeland Publications, 1974). Frederick K.C. Price : "God can't do anything in this earth realm except what we, the body of Christ, allow Him to do. Now that statement is so--that's so--that's so foreign and so contrary to tradition that, like I said, if they could get their hands on me right now most evangelicals would burn me at the stake and dismember me and feed me to the crocodiles, because they'll consider that statement to be just heresy." ("Ever Increasing Faith" program on TBN [1 May 1992], audiotape #PR11.) Cf. chapter 6, 85. Benny Hinn: He raises about $12 million a year with the usual false promises of healing and prosperity in exchange for "seed faith" gifts -- a condition for "miracles." "Give no less than $100," he exhorts an audience, and promises to "lay hands on all the envelopes and ask God for financial miracles for the givers." This comes from a man who just traded in his Mercedes for a Jaguar and recently moved from the exclusive Heathrow development to the even more exclusive Alaqua, where he now lives in a $685,000 home. His suits are tailored, his shoes are Italian leather, and his wrists and finger glitter with gold and diamonds ... what he considers a modest lifestyle, as if everyone lives like this. He wears his diamond Rolex, diamond rings, gold bracelet and custom suits for all to see. ..."What's the big deal, for goodness sake?" he says. "What am I supposed to do, drive a Honda? ...That's not in the Bible. ... I'm sick and tired about hearing about streets of gold [in heaven]. I don't need gold in heaven. I got to have it now." Ken Copeland: "When His blood poured out, it did not atone" (letter written and signed by Kenneth Copeland, issued by his office on March 12th 1979).